Sabor Tropical Supermarkets are conveniently located in the neighborhoods of Miami and its surrounding cities. For a reasonable price, customers can buy fresh produce, prime cuts of meat, baked goods, and specialty Hispanic pastries and dishes. They have a wide assortment of wine, spices, and dry goods. Shoppers can grab a pastry and Cuban coffee in the bakery. We visit grocery stores every week to stock up on food. Whether you are shopping in the produce section or browsing through the goodies in the bakery, the last thing on your mind is getting hurt at the grocery store. When stores are busy, they may be paying less attention to their customers’ safety. Accidents can happen while you are shopping. Some may result in minor cuts and scrapes, whereas others can cause more serious injuries. Slip and fall hazards exist in the aisles, entryways, sidewalks, and parking lots of the stores we visit. Broken carts, poor lighting, and unsafe shelves and displays can cause injury. If you have been hurt in a supermarket accident, call the Wolfson Law Firm at 305-285-1115 for a free and confidential consultation. 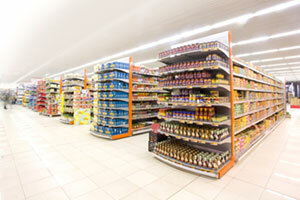 Slips and falls – This is the most common accident that occurs in a grocery store. The Slip and falls accidents may occur when water or other liquids are present on the floor. Customers may track in water when it is rainy outside. This can make entryways and aisles slick. Refrigerators and freezers located throughout the store can break, causing water to drip out onto the floor. Broken bottles that contain liquids can spill onto the floor. Liquid that is not cleaned up timely can cause a shopper to slip and fall. Stores typically mop their floors a few times throughout the day. Failing to section off the wet floor or use signs to alert customers can lead to slips and falls. Produce falling onto the floor are potential slip and fall hazards. Fruit that is stepped on may be picked up, but the slippery residue left behind isn’t cleaned up. Other items such as dry goods that have spilled, customer receipts, or plastic bags can cause slipping hazards if they are left lying on the floor. Trips and falls – Displays that are sticking out into the aisles, sharp corners of shelves, or debris left after restocking can cause trips and falls. Parking lots that have potholes, broken sidewalks, or uneven pavement leading up to the entryway may result in customers tripping as they are walking up to or leaving the building. Shelves and other hazards – Shelving that has too much weight or is not properly secured can tip over. Sharp corners of shelves or display cases can cause cuts and bruises. Overhead signs and lighting can cause hazards if they fall. If you have been injured in an accident at a grocery store or supermarket, the personal injury attorneys at the Wolfson Law Firm can help. Since 1963, we have defended the rights of victims who were injured through no fault of their own. With offices in Miami, Fort Lauderdale, West Palm Beach, and Fort Myers, we represent accident injury victims throughout South Florida. Contact the personal injury attorneys at the Wolfson Law Firm if you or a loved one was injured in a grocery store or supermarket accident. We offer a free and confidential consultation. Call 305-285-1115 today.